Gary Gordon and Mr. Yella Fella. Photo provided by Fossil Gate Farms. 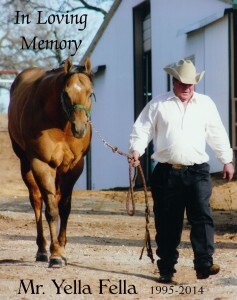 Mr. Yella Fella was a 1995 AQHA stallion by Paige Impressive and out of Let’s Skip Town. Not only did he personally achieve four World Champion titles, Yella’s get have gone on to be named World Champions in multiple breeds, such as AQHA, PHBA, APHA, and ABRA. Although Mr. Yella Fella is gone, he will certainly not be forgotten. Gordon sees her beloved palomino stallion every time she looks out into the broodmare pastures at Fossil Gate or when she passes by the stall of his look-alike son, FG A True Fella, who has gone on to become an impressive sire in his own right. It goes without question that Mr. Yella Fella will be regarded in the history books as one of the greatest palomino halter horses of all time. For Linda and Gary Gordon and the staff at Fossil Gate Farms, Yella was a part of their family. We would like to send our condolences to the Gordon family, everyone at Fossil Gate Farms, and Mr. Yella Fella fans around the world.